Lots of folks talk about how their communities recycle and such. But I live in the state of Florida, where the environmental journey is quite different. When I moved here a decade ago, hardly any homes had solar panels on them. Although things have changed some in the "Sunshine State" since then, solar still isn't the norm. On recycling day, I was astonished to see my neighbors’ recycling bins brimming with trash or yard waste. I quickly learned that recycling wasn’t required. When I approached the county about making it mandatory, I was told this would be too expensive because they’d have to hire people to monitor it, given the high rate of contamination. And then there’s the plastic bags. I see them flying along the highways, on the roadways, and in the lagoons. The county can’t recycle them, and the haulers won’t take them. A few grocery chains do—if you bring them in yourself and put them in their bins—so at least there's an option. 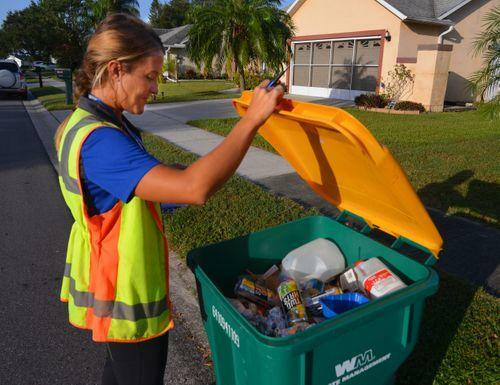 In Florida, state laws prohibit municipalities from limiting or banning the use of plastic water bottles, polystyrene, plastic wrappings, and single-use plastic bags. About a decade ago, under pressure from some local governments, state officials directed the Department of Environmental Protection to look into the plastic bag problem and provide recommendations. After two years or so, the DEP did—but municipalities weren’t allowed to take action until the state weighed in first. It's been eight years, and nothing has happened. Every year, when the relevant legislation is brought before the state, it gets bogged down in committee, never making it to the floor. That’s just part of why Florida has a very different environmental journey. But there are other challenges, too. Our waterways develop algae blooms that kill and sicken the fish, dolphins, birds, and other animals. Oil and gas companies use sonic cannons for undersea resource exploration, to the detriment of ocean life. Other companies want to pump treated sewage into the state’s aquifers, affecting our drinking water. It seems that almost everything in Florida is for sale to the highest bidder—the people be damned. "It seems that almost everything in Florida is for sale to the highest bidder—the people be damned." In my free time, I volunteer for a local nonprofit that works to show people, particularly children, the advantages of recycling for both people and the planet. I’m also a trained Climate Reality Leader and give public presentations on the effects of climate change (more-intense hurricanes being a particularly acute one). I’m a big fan of minimalism and sustainability and attempt to keep those two things front and center in my everyday life. So, how do I survive in a place where eco isn’t the norm? It’s a small step, but for the past seven years I’ve carried a homemade “green restaurant kit” in my purse for whenever we eat out. Some places sell similar restaurant survival kits, but I assembled mine over time, as my budget allowed, with items I know I’ll use. a cloth napkin, because I like to use them! This kit has prevented a lot of disposables from going to the landfill. Even better, it’s given me a terrific opportunity to educate people along the way. Folks often stare at me when I pull out my kit, and I’ve had wait staff argue with me about not taking a straw or a box or whatever. But I’m always happy to explain what I have, why I have it, and how it helps to protect the environment. 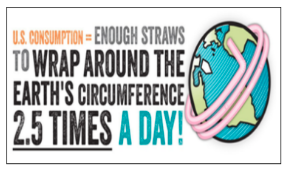 I also hand out little business-sized cards that tell people how many plastic straws are being used in this country alone. And yes, I carry a large purse! What other steps do I take? Recently, I purchased a new home and decided to do the housewarming party a little differently this time. For one, I requested no gifts, because at my age (retired), the last thing we need are more “things.” Instead, I sent my friends and family a list of items needed at the local animal shelter, and requested that they donate there instead. When I told folks we were able to get every last item, they were stunned and delighted. I suggested that they share the idea at their own events, like birthday or anniversary parties. The second thing I did differently was to “green” my party. For me, planning a housewarming was no different from having guests over. We emailed our invitations or called folks by phone. And we tried hard to buy nothing disposable. I’ve used cloth napkins for at least 20 years and have never understood why people use paper; it's just not the same. "I’ve used cloth napkins for at least 20 years and have never understood why people use paper; it's just not the same." As for dishes, glasses, and cutlery, I decided many years ago that having guests over to my home and using disposable anything was disrespectful to them. The only adjustment I made for the party was to buy extra dishes, plates, glasses, and cutlery from a local thrift store to accommodate everyone. Our new home doesn’t have a dishwasher, so it takes a little longer to clean up. When I ran out of a few dishes during the party, I took the dirty ones inside, washed them, and brought them back out. Piece of cake! In the end, by not having any disposables at the event, we had almost no trash. We recycled the soda and beer cans, as well as all the wine bottles. My tip for a simple, green party? Just don’t use disposables. Really, it doesn’t take much. Someday I’d like to host a zero waste party, which among other things would mean composting any and all food scraps. I came pretty darn close at my housewarming. I made most of the food from scratch, which saved on packaging (though I did buy crackers and chips). I didn’t use any table decorations and I composted all the leftover vegetables on guest’s plates, freezing the rest to make soup with later. I surprised myself here. I didn’t do too bad. Since the Parkland school shooting in February, there’s been a lot of talk here in Florida about whether the ramped-up student activism will change anything. I’ve seen the faces of those young people, and they are very determined to right the wrongs that the adults in their lives have done nothing about. And I truly believe they will do just that. When it comes to our foolish beliefs that we don’t have to change our habits, or take responsibility for the state of this planet, young people are the hope of this country. Personally, I’m hopeful they’ll be the ones to convince their families that not using disposables is the new “cool” thing to do. And no, I don’t think I’m cool. I’m just a proud grandmother who wants my grandsons to see the same blue sky and green trees that I’ve grown up with, and to enjoy the sounds of birds singing when they wake up in the morning. "I’m just a proud grandmother who wants my grandsons to see the same blue sky and green trees that I’ve grown up with, and to enjoy the sounds of birds singing when they wake up in the morning." The planet has reached a tipping point, and it’s time for all of us to realize that we have to modify our behaviors in order to ensure that the people who come after us have a safe and healthy environment to live in—and that we treat the other inhabitants of this planet (the fish, birds, and other creatures) with that same deep respect. I want my grandchildren to live the new dream, not the old dream where people don’t take responsibility for their lives and for the survival of the planet for future generations. I’ve loved the earth since I was a child, but it wasn’t until I retired and moved to Florida that I began to really see what was happening to it. We can all work together to provide a sustainable world, and it’s our job to make that happen. Christine Kane is a trained Climate Reality Leader; a self-taught family herbalist; a wife, mother, and grandmother; and a social activist in the state of Florida, where she moved after retiring from New York in 2010.